The ancient Aboriginals believed that the spirits of the country would be wrathful if the correct ceremonies and rituals were not performed at exactly the right time and in the right location. Their culture revolved around care of the land (country). What I would consider to be work on the farm, they would consider a ritual. Before those rituals were done by the Aboriginals, signs from the landscape were sought and the proper ceremonies were conducted. If the signs were wrong, then the ceremony and ritual didn’t get started. In an environment that has a great deal of variability in the weather, it probably is a very good idea to seek signs in the landscape to guide your farming practices. Tomatoes are a late summer / autumn crop at the farm. The small area I set aside for that fruit can yield more than 50kg (110 pounds) per season. 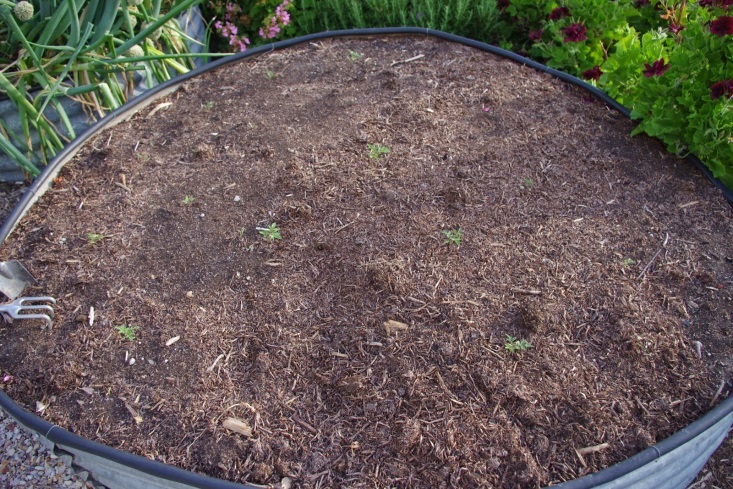 In this part of the world there is an unwritten – but often quoted – rule that tomato seedlings should be planted outside on or around Melbourne Cup Day (the first Tuesday in November). Incidentally, Melbourne Cup Day refers to the public holiday for an annual horse race. The difference between the two tomato beds is quite stark, especially given that all plants were germinated at the same time and from the same seed. No seedlings died in the October tomato bed. However, at least half of all seedlings planted in the November tomato bed died and I have since used all of my available seedlings making up for the loss in that garden bed. The entire exercise has shown me that I initially read the signs correctly and then failed to plant all of the tomato seedlings at that time. It will be interesting to note the differences between the two tomato beds as the season progresses. To give an indication of just how variable the climate is here, I read in the diary that only two years ago yesterday, I was planting out tomato seedlings! A few weeks back, I was asked about how the birds which live on the farm have access to a constant supply of water. 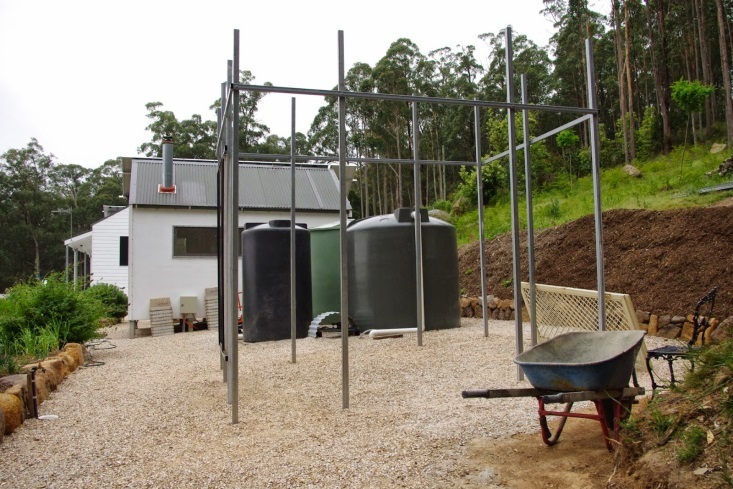 The answer is that the overflow reserve tank has a flat roof which shouldn’t but does collect and store water (it is not mingled with the tank water). 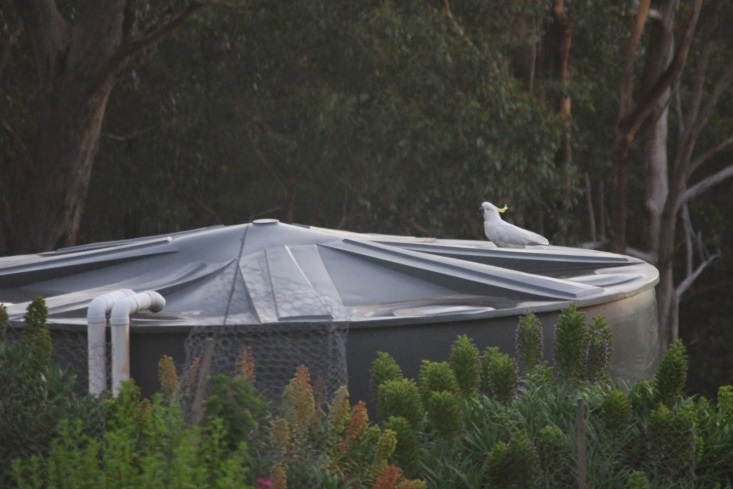 As the roof of that water tank is well off the ground, it is a safe spot for all of the birds to land on and have both a drink and a splash around in (they’ll often have a cooling bath in that water during summer). For most of the year the water on the roof of that tank is supplied and cleaned by rainfall, but as the summer gets hotter and drier, I have to pump water onto the roof to keep the birds happy. In breaking rock news (sorry, bad joke alert! ): The new stairs have had rocks placed alongside each step. These rocks were put in place because they stop all of the animals and birds on the farm kicking mulch out of the garden beds and onto the steps. 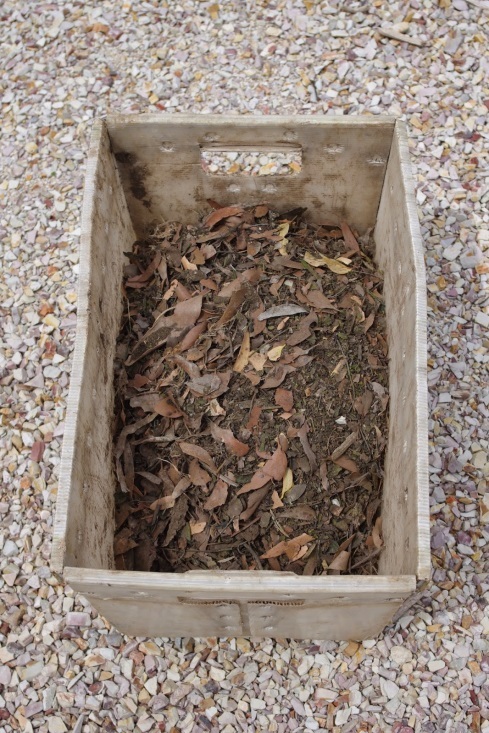 A great deal of woody composted mulch was also placed onto the garden beds on either side of the concrete stairs. 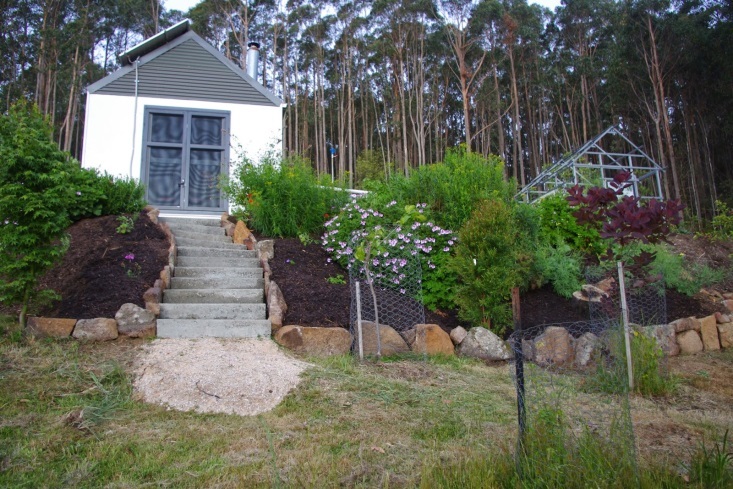 Observant readers will note just how deeply I mound mulch here – if they look closely at the garden bed on the left hand side of the stairs. Those garden beds are intended to be a summer flowering garden bed. I’ve planted directly into the mulch with very hardy plants: salvia’s, geraniums and daisies and they all seem to be doing well. The rock wall to the right of the stairs is now complete too. Some of those rocks were so big and heavy that they’ve bent the steel wheelbarrow out of shape. 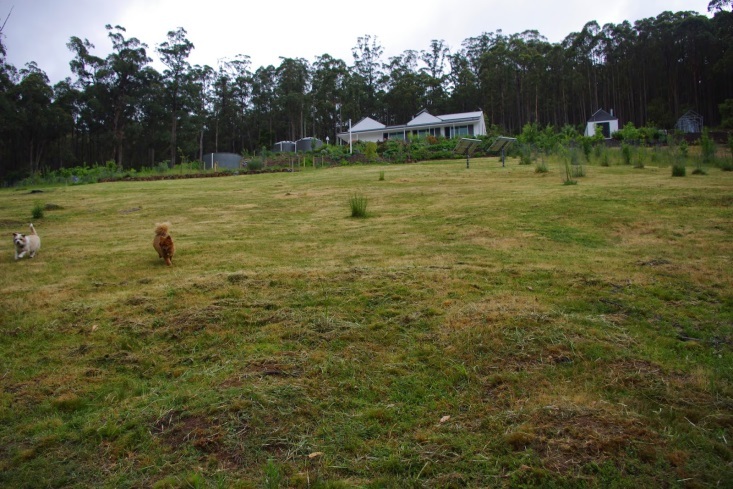 Mowing services are usually provided by the native animals. Stumpy the wallaby and co. do a great job keeping the herbage down. However, usually once per year they are overwhelmed and I have to get the Honda 19 inch push mower out and start walking around. It usually takes about three days of walking to cover the entire farm area. Usually, I start this job in December, but the season here is both warmer and drier, so the signs are suggesting an earlier mowing date would be wise. The slope of the land at the farm is too steep for a conventional ride on mower as it would tip over and seriously injure me. Even a quad bike feels unsafe due to the slope, and I commuted on a motorcycle for about a decade. It isn’t cost effective to purchase a small four wheel drive tractor as it would only be operated for a few days per year. I’d be interested in hearing about peoples experiences with mowing in these sorts of conditions? When I first moved up here to the farm, I asked many of the locals and the general consensus was that an expensive tractor would do the job – but this is an uneconomical solution. 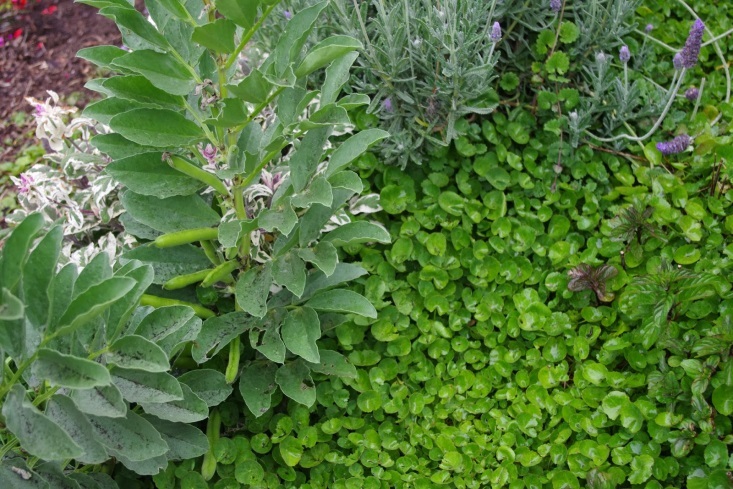 It would be optimal to keep the herbage long (about 1m or 3 foot in height) over summer. 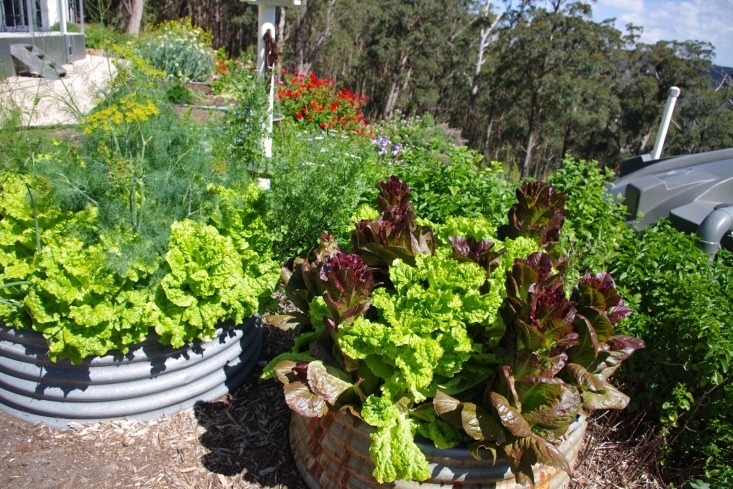 Longer herbage provides for shading of the soil from the hot sun, which reduces evaporation of water in the soil. 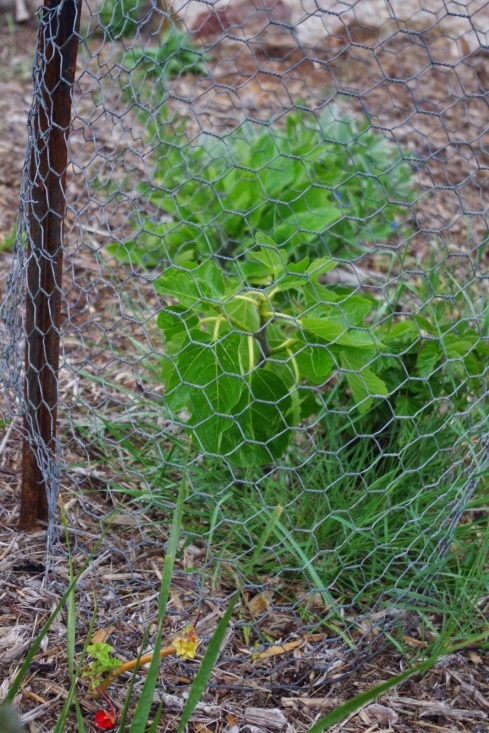 This would stop the herbage from dying off and also further reduces the water stress on the fruit trees and forest. However, this is not possible because I cannot rule out the possibility of arson and higher herbage burns much hotter than low herbage. A couple of days later, I started cladding the new shed with the old iron that I picked up from the tip a few weeks back. By the time that the job is finished, it will look like the shed was there for a 100 years! 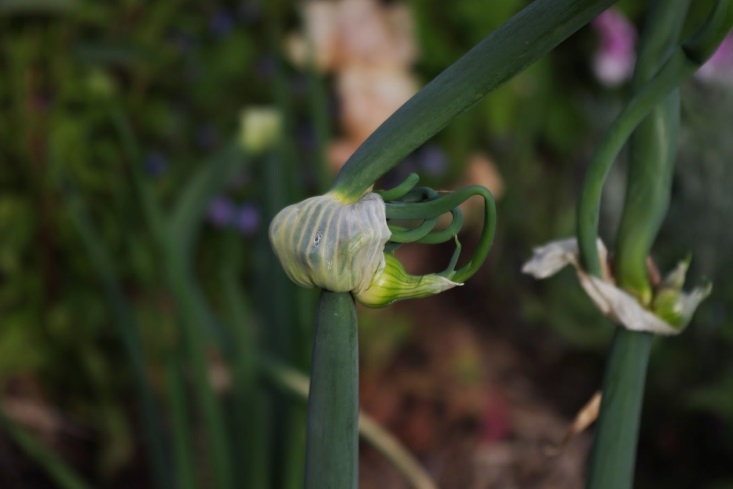 One of the more unusual onions which I grow at the farm is the Egyptian walking (or tree) onion. 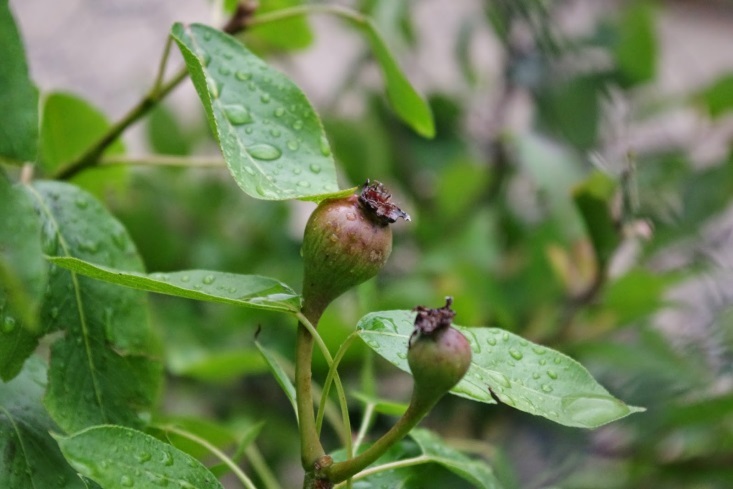 The plant produces either one or two lots of bulbils which can be broken up and planted. Each bulbil will produce a whole new plant, so I’ve been spreading them all across the farm and each year there are more of these wonderful plants. The old timers used to pickle the onions for later consumption. Unfortunately, the strawberry plants have overgrown the path that I put into the strawberry bed and I can’t see it anymore! 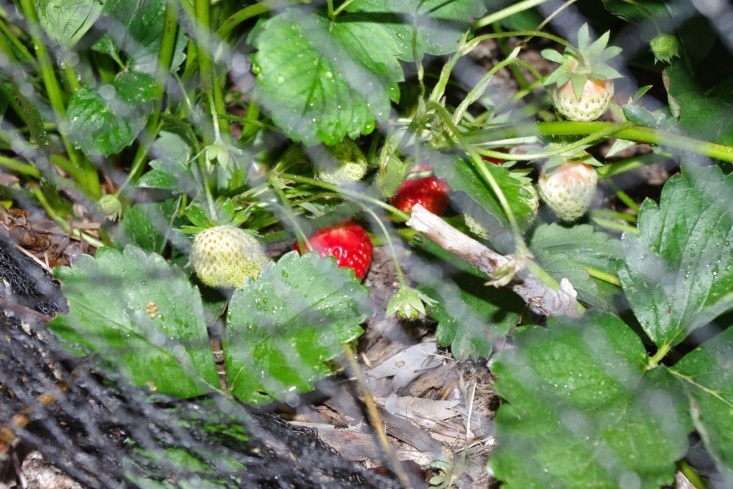 I spotted a really good idea for the strawberry beds and intend to change the entire arrangement over summer when I get a bit more free time. The temperature outside here at about 8.00pm is 8.7 degrees Celsius (47.7’F). So far this year there has been 717.2mm (28.2 inches) of rainfall which is up from last week’s total of 712.4mm (28.0 inches). Please note that today’s rainfall is not included in that total. At the farm which is in the middle of the mountain range, the sky literally turned red due to the smoke. As a bit of background history about the mountain range: way back in 1983 on 16th February, the Ash Wednesday bushfires burnt through this mountain range. On that one day alone over 1 million acres of land were burnt in every imaginable environment outside of urban areas which includes forests, coastline and also grasslands. The heat generated by the fires at some locations was estimated to have exceeded 2,000’C (3,632’F) degrees which exceeded that recorded during the Allied bombing of Dresden in World War II. In fact, the heat and energy per metre produced by the Ash Wednesday fires was estimated to be similar to that of the atomic bomb dropped on Hiroshima. Anyway, the fires on that day back in February 1983 worked their way up into the mountain range by way of the regular NW prevailing winds through that very patch of forest that was burnt off this week. Some people say that lightning doesn’t strike in the same place twice, whilst I reckon they’re talking total rubbish as common sense says that it does. 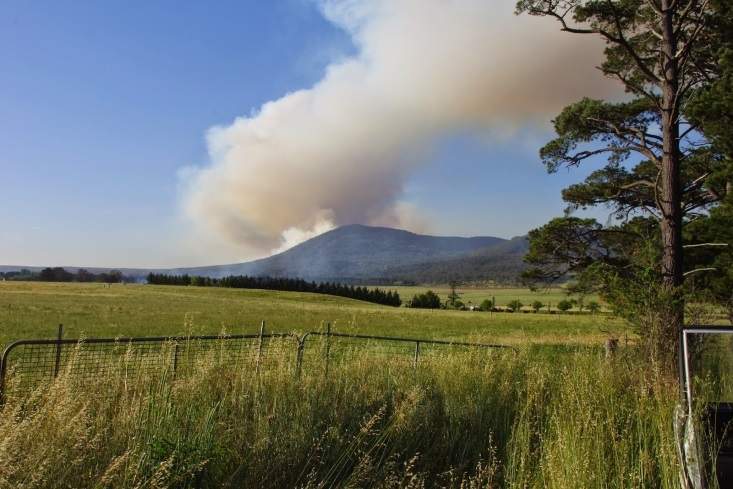 History has provided a salient lesson and I needed no further incentive to do the best that I can at the farm here to prepare for the eventuality of a bushfire at some stage in the future. 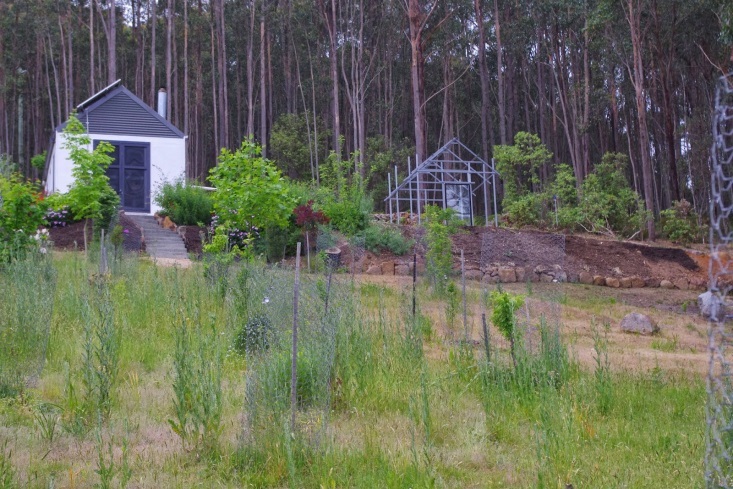 I have a list of projects that would be ideal to complete before the bushfire season is upon me and I’m slowly working through the list. Seeing the burn-off this week has however provided a sense of urgency that I hadn’t quite felt before. The construction of the new steel shed (i.e. steel is unlikely to burn) is one of those projects on the list and you can see it progressing in the background of this photo below which looks across the bee garden. This week I continued construction on the new shed and installed the steel roof trusses. Hopefully the shed will be covered by the old recycled steel sheeting by next weekend. The photo below puts the new shed into context as it shows the new shed under construction relative to the existing cantina shed. Incidentally, it was suggested by Lewis that a cantina in the US is considered to be a bar that serves alcohol in the South West of the US. I hadn’t known that usage of the word! At the farm here a “cantina” refers to the more traditional Italian usage which includes the storage and place of preparation for all of the preserved food and the various other bits of equipment that the farm requires. On a small holding, you have to be able to store all sorts of weird and wonderful equipment that only gets hauled out for use every now and then. All of those items just make certain jobs about the farm that much easier and without them you may not be able to even undertake the job. 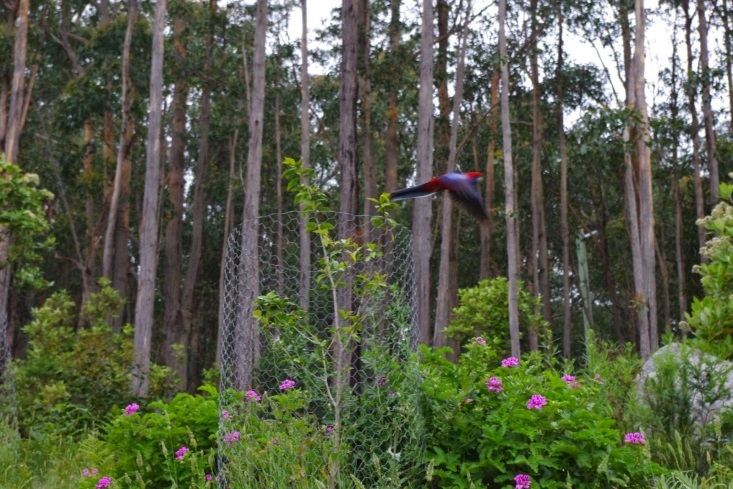 Bird netting is a good example as it has to be stored somewhere but it really keeps the pesky local parrots off the fruit trees and their ripening fruit. The reason for all of this monkey business with the roof and vacuum is that the weather bureau had predicted that Saturday night would bring a 90% chance of between 10mm (a bit less than 1/2 inch) to 20mm (a bit less than 1 inch) of rainfall which was brought all the way down south here from the tropics. The barometer on the weather station here concurred with that prediction and suggested that a storm was approaching. By Sunday morning, 35mm (1.4 inches) of rain had fallen on the farm and the water storage tanks were by now full and there were smiles all around. 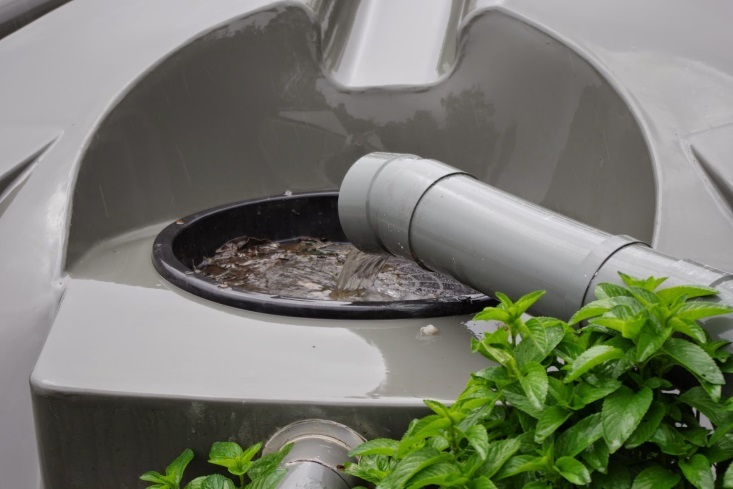 Vacuuming the gunk before the heavy tropical rain fell on the farm meant that I didn’t have to get up at 3am – in the heavy rain – and clear the mesh filters on the water tanks. If those filters get blocked up then any water collected from the roof overflows and is lost to the soil. 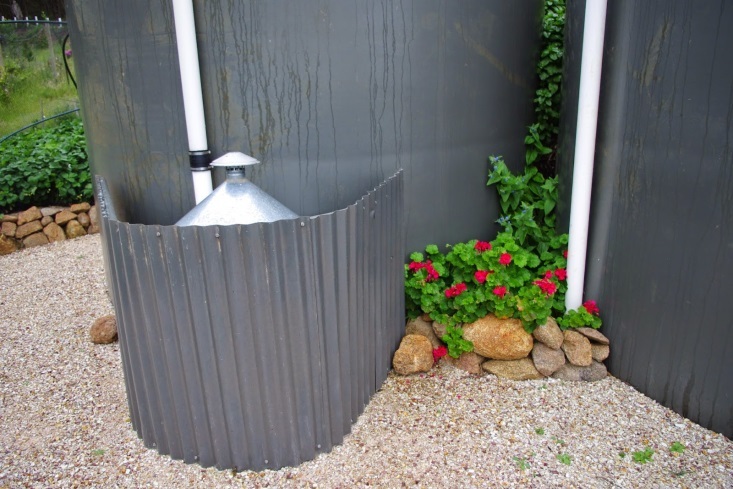 I’d much rather collect every single drop of rain possible and head into summer with full water storage tanks. 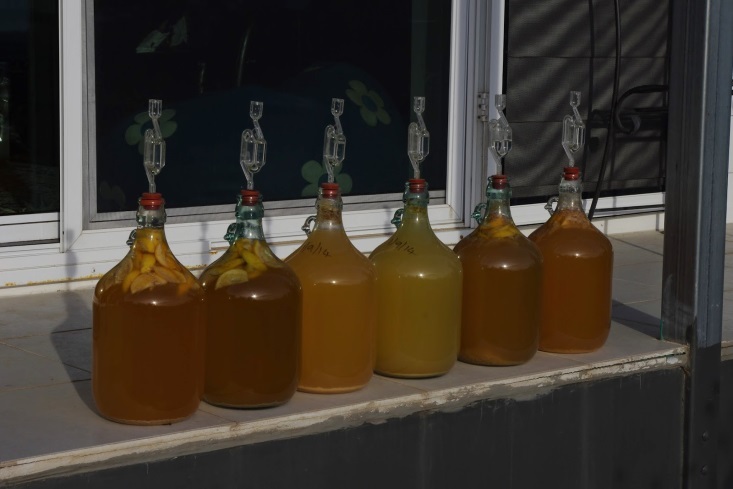 The system worked perfectly too and by Sunday morning 10,500L (2,763 gallons) of rain water had passed through the system. Speaking of water, during the week I repaired the steel heat shield which covers the house water pump. That water pump is a crucial piece of infrastructure and is now covered by two layers of steel. 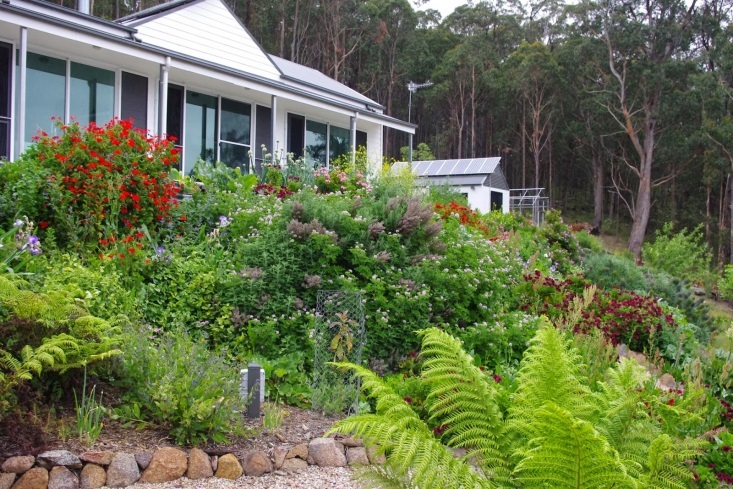 In the event of a bushfire that water pump provides water pressure to two of the permanently installed sprinklers, plus several hoses about the house, so it is worth the little bit of extra protection. As I was sitting in the orchard supervising the chooks, I happened to hear a rustling sound and went to investigate. It was an Echidna – which is the land based relative of the platypus. They’re like a spiny ant eater and are on the few animals other than members of the reptile family that lurk about during the daylight hours. 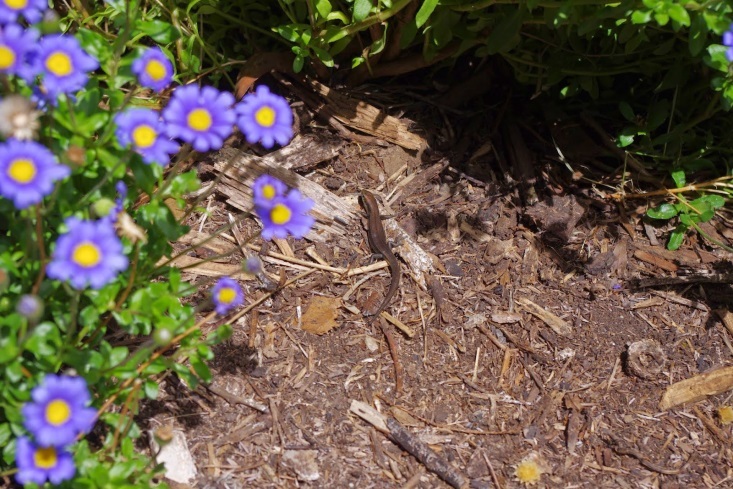 It was trying to hide from me under a rock, so after taking the photo, I left it alone to go about its business. 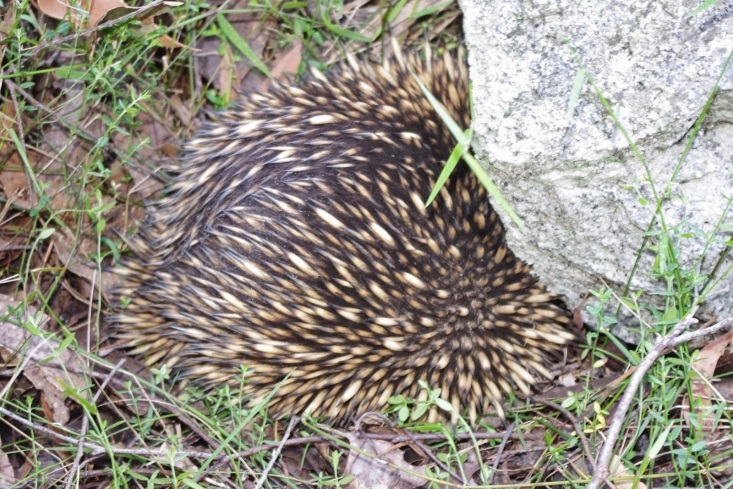 Echidna – if you can’t see my head, you can’t see me! The temperature outside here at about 9.00pm is 10.6 degrees Celsius (51’F). So far this year there has been 712.4mm (28.0 inches) of rainfall which is up from last week’s total of 676.8mm (26.6 inches). The title of this week’s blog is a nod to Steven King’s truly frightening short story written way back in 1978. The story revolved around a demon haunted town in the corn belt of the US. The demon in that town decreed that no one in that area should live past their 19th birthday and all of the children in that town ruthlessly assisted in the enforcement of that decree. In that imaginary town a person who was 19 years and 1 day old would possibly be facing some immediate and reasonable fears for their personal safety! 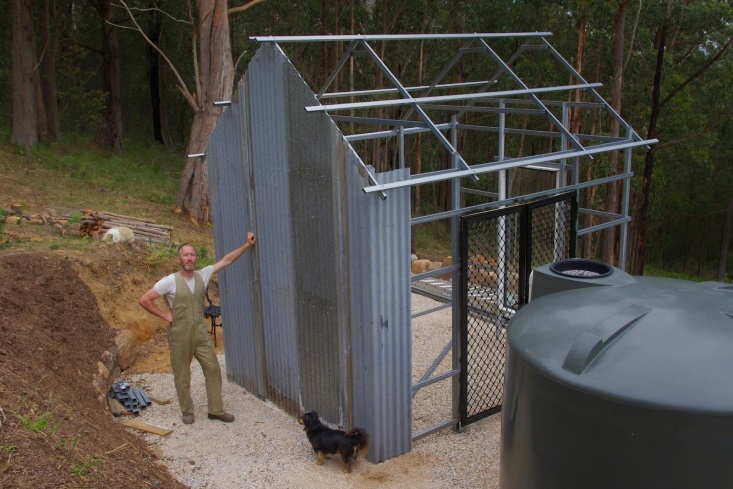 So, what could all that possibly have to do with a small farm Down Under? Have I decided to chuck all caution to the wind and grow only corn here and enforce rules which could only ever quickly lead to my own untimely demise (being well past 19 years old)? Perhaps someone has been messing with the local malevolent spirits? Well, not really (and hopefully not anyway). The truth of the matter is that I have simply run out of established space with which to grow edibles. 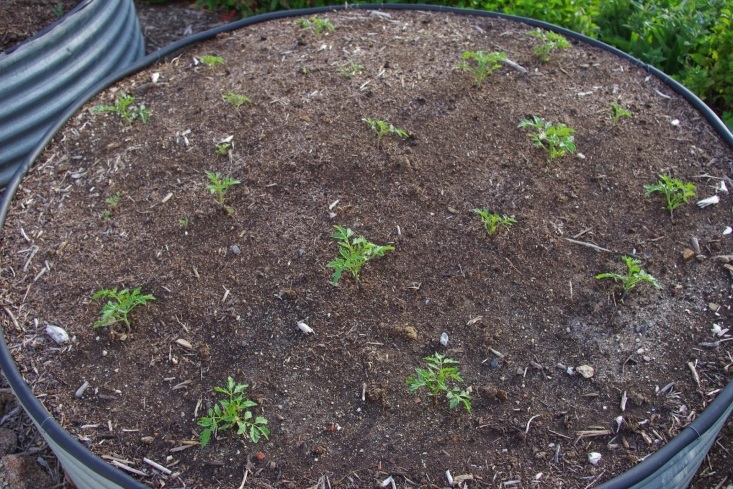 To get around that problem, I have had to remove perfectly healthy and edible plants so that I can get the next round of crops growing in their place. Somehow, I’ve become like the demon in the short story as I’m cutting down vegetables in their prime. 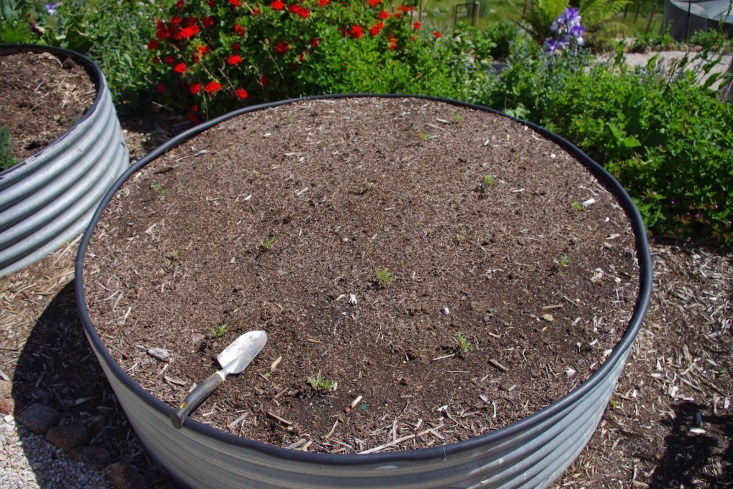 If I don’t get the next crop of salad greens in the ground shortly, then during high summer – which is not that far away – there will be no salad greens for me to eat. 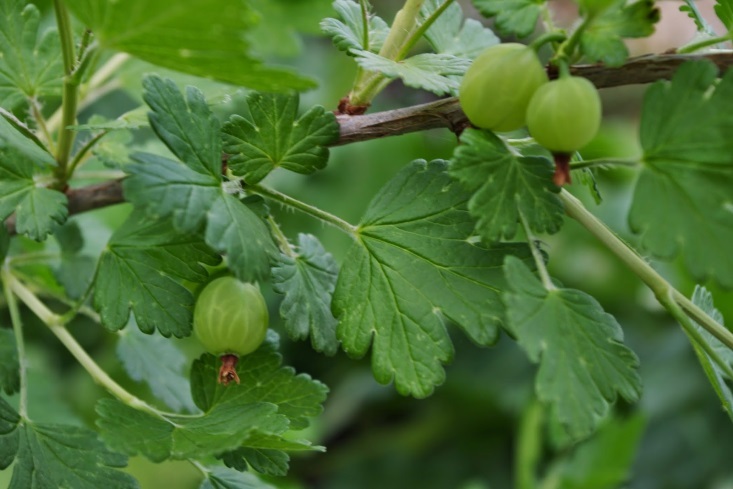 The reason for this is that it is very difficult to establish new crops in high summer due to the extreme heat and sunlight both of which kill seedlings. That was my fate from only a few short years ago to learn this harsh lesson. A shade house would be very handy in these circumstances, but I don’t have one – at present, anyway. 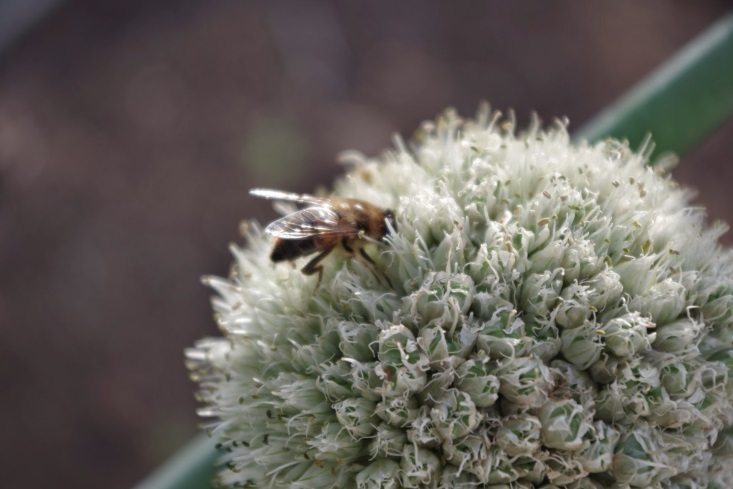 As I also collect seed from the plants here, it becomes a delicate balance between: having crops ready to eat, leaving some crops to go to seed and getting in new crops for future food. 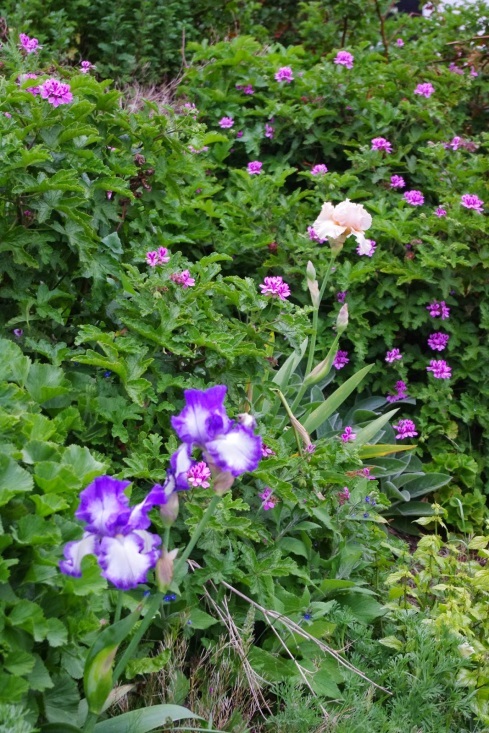 It is a really complex problem to solve especially if planting space is limited. Throw in a couple of unknown variables such as climate and predation by the local wildlife and that problem becomes even more difficult to solve. For example, Stumpy the house wallaby may just decide – without warning – that the Australian yellow leaf lettuce he’d had his eye on, suddenly becomes the next big taste sensation. 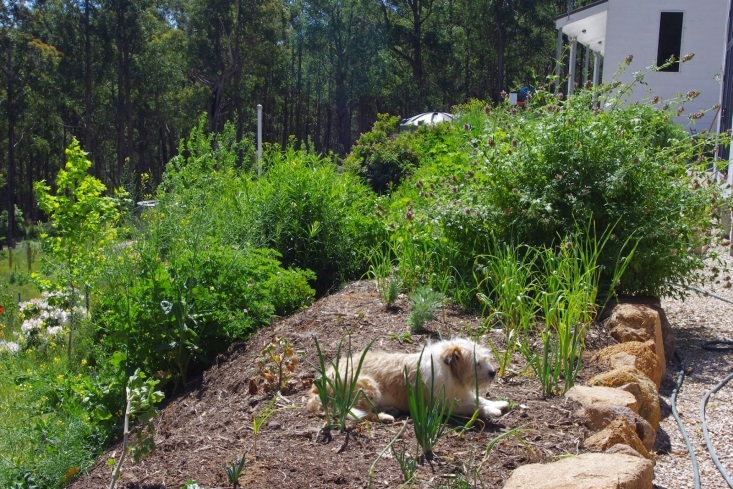 The next morning you may possibly awaken to find a healthy and very well fed wallaby sitting in the vegetable garden happily munching on that lettuce. Whilst this would be bad enough if you had intended to eat the lettuce in your lunch, it could possibly be disastrous if you were planning to save seed from those plants! 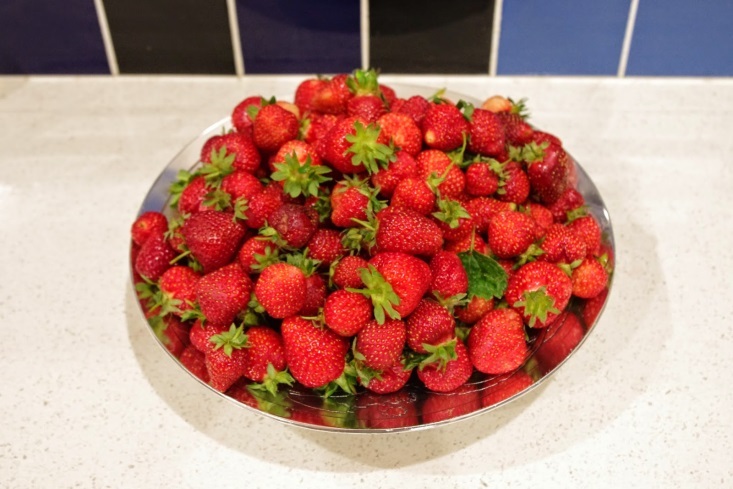 Climate is the other unknown variable as for example: local lore handed down from time immemorial says to get your tomatoes outside of the house and in the ground by Melbourne Cup day (the first Tuesday in November). Well, this year was a warm October, so I probably could have had them outside in the sun by mid-October. It was interesting too that this year I spotted a self-seeded tomato plant in mid-October which was a few weeks before I’d even planted the tomatoes outside. The photo above shows the cherry tomato plants happily growing in the warm conditions here. This is their second year as last year I selected seed from a particular plant which fruited a full month earlier than all other varieties. That plant also produced a good sized and good tasting crop too. 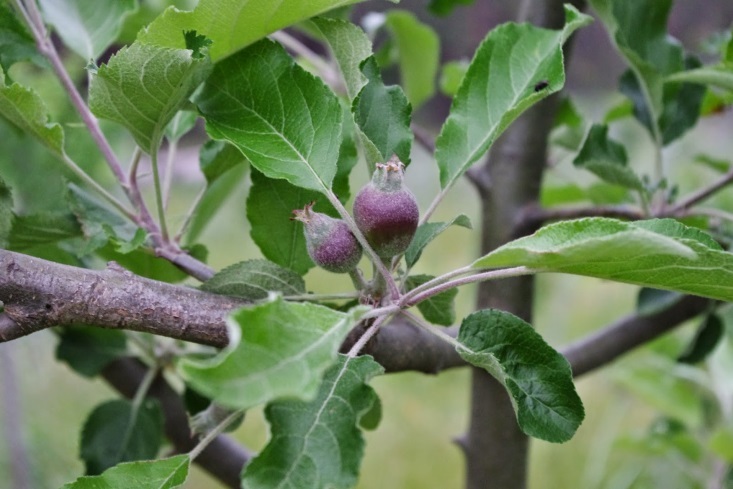 All being well, the fruit should commence ripening from about mid-February and will continue to ripen until early June. 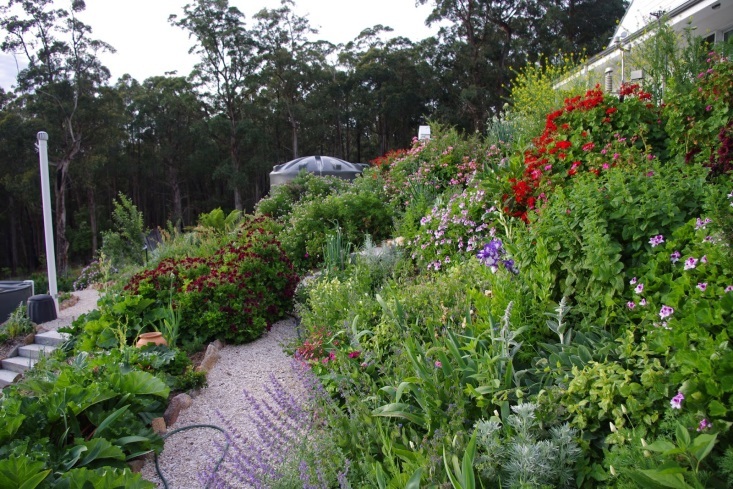 Many years ago, I wouldn’t have had the heart to clear the growing beds for the next crop as I was just so grateful that anything at all was growing. However, now it’s more like: “we’re done here – prepare yourselves to become chook food!” How things have changed these past few years. Construction on the new shed has continued apace, and now all of the posts are cemented into the ground. The next activity – all being well – will be installing the roof trusses, battens and bracing. 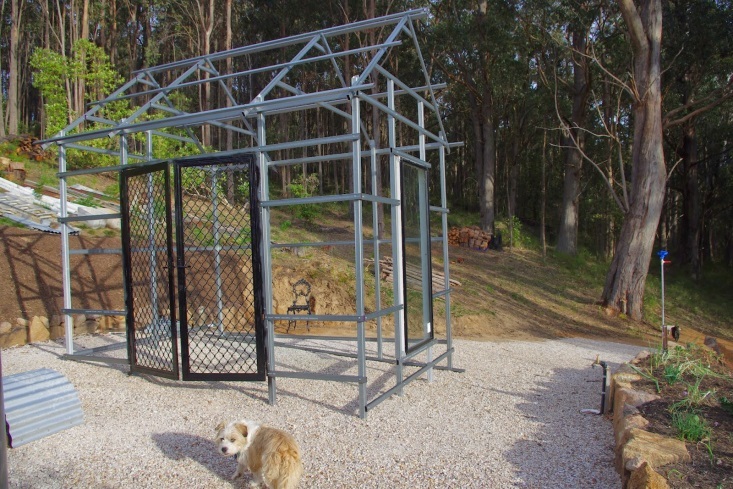 I’m really excited about this shed but it is also becoming necessary for me to complete the construction before the serious bushfire weather hits here during summer. 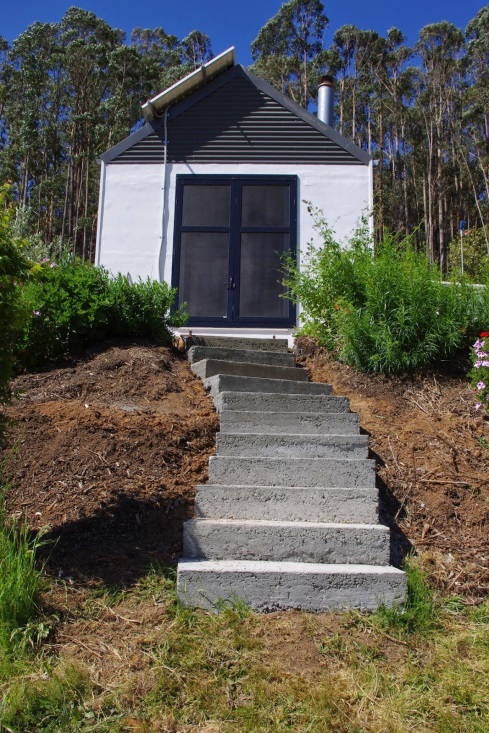 The concrete stairs below the cantina shed are now complete! 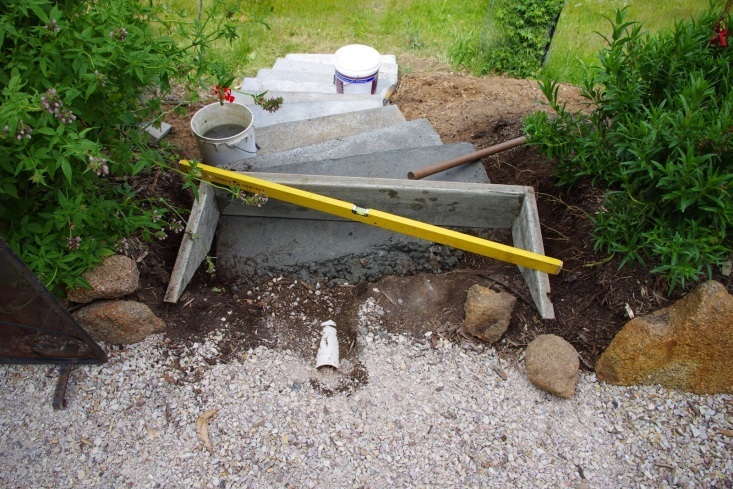 I thought that the photo below might be useful for anyone who may be considering constructing their own concrete steps as it shows the timber formwork in place and ready to receive the cement mix. The yellow level stick gives a good indicator as to whether the stairs are constructed level front to back and also side to side. If the timber is not exactly level, it can easily be propped up on one edge or another before pouring the cement mix. Observant readers may notice the white pipe and this is covering a much smaller ¾ inch (20mm) water pipe that travels underneath the stairs. Should that water pipe ever break or leak, I should be able to pull a new water pipe through that much larger white pipe – without damaging the stairs. 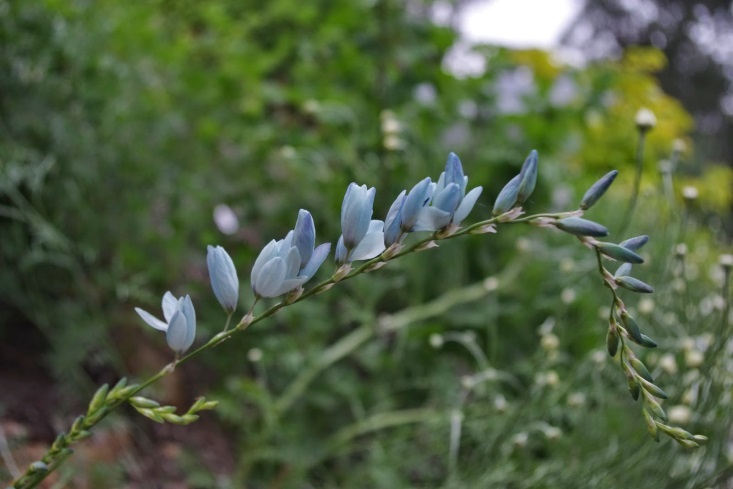 There are only a few Ixia flowers about the place, but they are really noticeable because they have an eye catching light blue colour for their flowers. You rarely see that particular colour in nature. 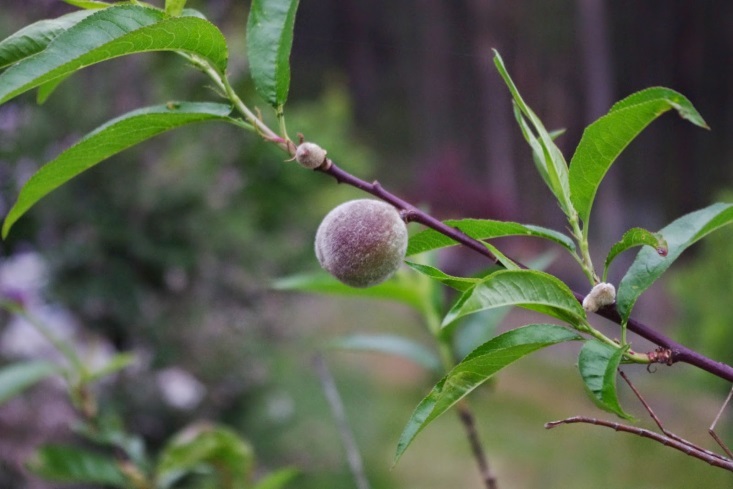 The peaches and nectarines are interesting, because in the humid spring climate here, they consistently develop curly leaf which is a fungal disease. 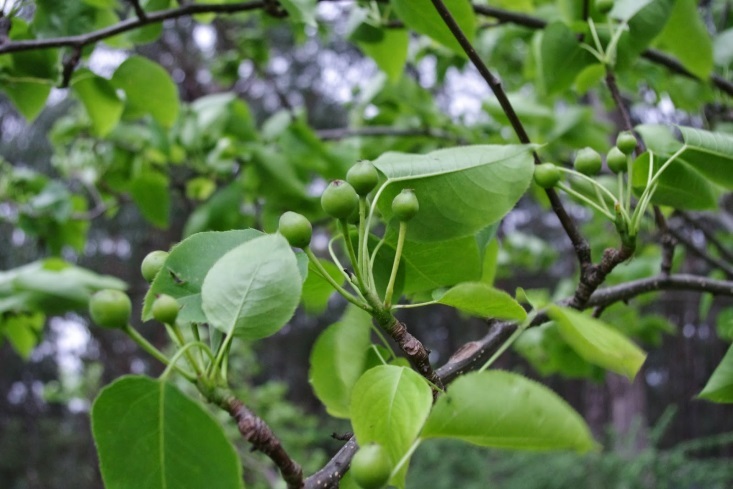 It is recommended to spray copper fungicide on the trees at various stages throughout the year. However, a few years ago, I undertook an experiment to see what would happen if I simply stopped spraying the peach and nectarine trees. My reasoning behind this is that not only does the copper spray cost money and time to apply to the fruit trees, but it will also kill fungal growths in the soil (both beneficial and non-beneficial) as it drips off the fruit trees leaves. 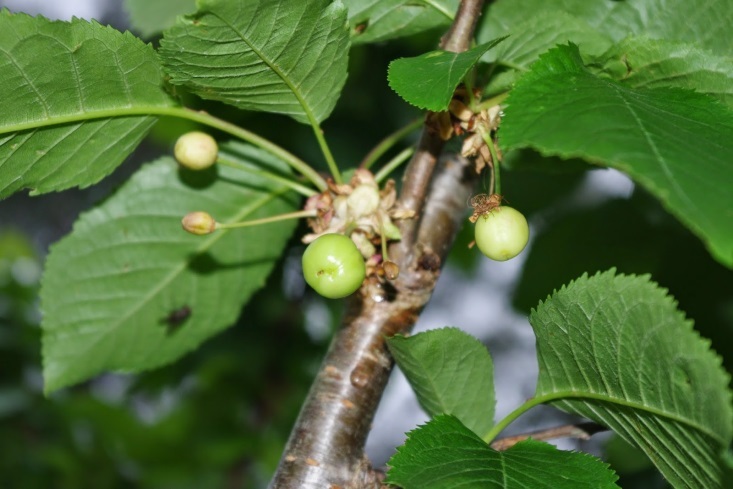 The results have been mixed, but I can say with certainty that about half of these fruit trees survived and have since become more productive and less affected by the curly leaf, whilst others died. However, I do not regret undertaking the experiment as I have seen quite old peach and nectarine trees that receive no attention at all and yet still produce fruit. In a strange and unusual turn of events on Sunday evening I spotted a rabbit running up the driveway. It is unusual because it is the first rabbit that I have seen here in eight years. I set one of the dogs on the trail of the rabbit but it had clearly left the farm. However, past experience has taught me that it is unwise to completely ignore strange and unusual events. This week has been quite warm for this time of year and by Saturday evening I was feeling the beginning stages of heat exhaustion after working outside in the sun all day. Today has been much cooler and the temperature outside here at about 9.45pm is 8.0 degrees Celsius (46.4’F). So far this year there has been 676.8mm (26.6 inches) of rainfall which is up from last week’s total of 676.4mm (26.6 inches).